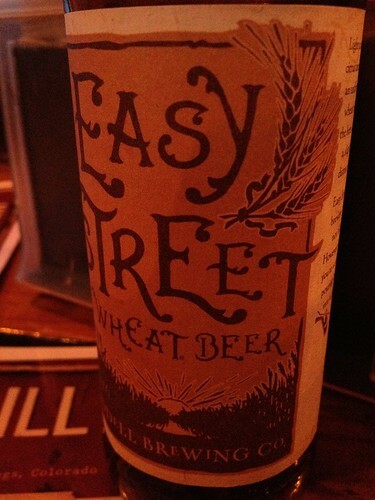 Odell Easy Street Wheat Beer, originally uploaded by adambarhan. Appearance: Pours out a cloudy, straw-colored body with a frothed, white head. Smell: Opens with a noted lemon character and light, background floral tones. Taste: Lightly sweet maltiness tasting of crisp wheat crackers with a hint of grain. Touch of lemon peels. Floral hop character with a faint balancing bitterness. Crisp, dry finish. Drinkability: Though simple, it’s nicely refreshing and easily drinkable. Any beer named easy street is okay in my book.